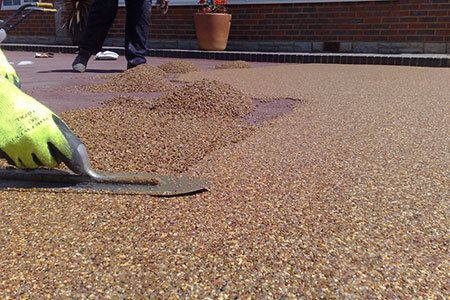 Resin bonded aggregate systems are hardwearing slip resistant and decorative. They create the look of a natural aggregate surface, without loose gravel, and can be used in areas where foot, vehicle and heavier traffic will be present. The typical areas of use are Driveways, ramps, paths, large landscaping areas, balconies, roof gardens, roads, patios, podium decks, car parks and general public areas. Resin Bonded Aggregates can be applied to bituminous, cementitious, metal and timber surfaces. The system is self priming, and tolerant to cold and damp surfaces, and can be laid in temperatures up to 30 degrees. The system has a natural stone effect, which is decorative and aesthetically pleasing, and is available in a range of colours and aggregate sizes. The finished surface will be non-slip, durable, hardwearing and low maintenance with a life expectancy of 10 years in most environments. 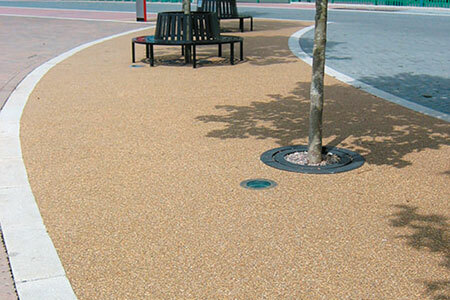 Resin Bound Aggregate systems provide decorative surfaces for pedestrian and vehicular traffic, and are laid to create functional seamless surfaces with slight flexibility. Typical areas of use are footpaths, playgrounds, pool surrounds, concourses, promenades, driveways, car parking bays, showrooms, shops, reception areas, galleries, gardens, patios, terraces, water features and roof gardens. Fully meets SuDS requirements (Sustainable Urban Drainage Systems) which is a current planning requirement designed to reduce the potential of flooding on urban developments. The open matrix of a resin Bound System allows water to drain through to the base and reduce water ponding, and this action will naturally feed any surrounding planted areas and trees. This system is also decorative, but designed to be highly porous, allowing the tree to feed. A slip resistant finish can be achieved and is unaffected by water. The Tree Pit system comprises a two component polyurethane hybrid resin and a range of selected attractive aggregates. The resin is mixed with the aggregate and laid at the specified thickness (anywhere between 12mm and 25mm). A fine aggregate may be used to increase the slip resistance of the finished surface. The system is UV resistant and will not yellow on exposure to UV light. This is a more attractive option than other types of resin which can yellow and dramatically alter the appearance of the finished surface. Highly porous with excellent drainage creating an attractive natural aggregate appearance using a UV stable non yellowing resin. Low maintenance, and an alternative to conventional paving. A tree pit with this system also helps reduces the build-up of litter and mess.